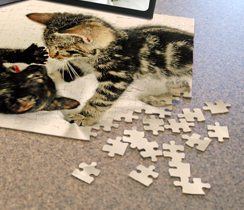 Create a personalized puzzle with your favorite photo! 10x14 252 Piece Puzzle comes in pieces in a designer box with your photo on top. Great gift for kids, grandparents, bridesmaids, birthdays and anniversaries.